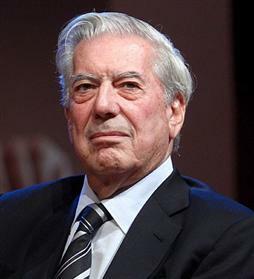 Peruvian author Mario Vargas Llosa was awarded the 2010 Nobel prize in Literature. Vargas Llosa is part of the so-called “Latin American Boom,” the literary movement in the 1960’s that propelled Latin American narrative, especially the novel, to the highest echelons of World Literature. The “Boom,” as it is sometimes called, introduced such literary modes as “magic realism,” popularized by Gabriel García Márquez -who won the Nobel in 1967- and politically engaged works such as Vargas Llosa. While García Márquez’s narrative is straightforward -at least on a superficial reading- Vargas Llosa’s is structurally much more complex; he frequently eschews linear plots and univocal narratives for complex timeframes and plurivocal exploration of a politically engaged theme, such as power structures and poverty. Below is the announcement in Stockholm of the Nobel award, in Swedish, English and Spanish. Vargas Llosa interviewed about his work. In Spanish. In 2007, he addressed the Letras Libres Forum held in Monterrey, Mexico, as one of the 8 intellectual “heavy weights” of the worlds. His lecture was on the links between literature and reality. In Spanish, with English subtitles.